Manufacturer of a wide range of products which include oil free screw air compressors and two stage water cooled. 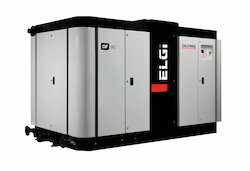 We offer Oil Free Screw Air Compressors to our clients. We have been counted amongst the most trusted names in this business, involved in offering Oil Free Electric Screw Compressor. This Oil Free Air Screw Compressor is backed by emerging technology that conserves natural resources and environment from pollution. Our product range is available in different models and sizes.